Children grow and develop rapidly. This means that their teeth change with them. Children also change, of course, so the dentist has to deal with them in a slightly different way all the time. Dental treatment for children is tailor-made. 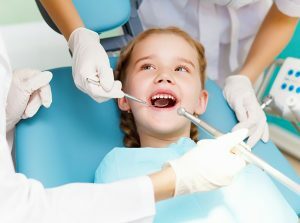 For example, if your child is afraid of the dentist or suddenly appears to have a lot of cavities, but is still too young to be treated extensively, our specialised paediatrician will take over the treatment with your consent. Once that part of the treatment has been completed, we will discuss with you when your own dentist can take over the dental care.